In the 1980’s the study of seasonal affective disorder (SAD) was in its early stages. My knowledge then mostly came from studying my own symptoms. If only I’d had Norman E. Rosenthal’s book Winter Blues[i] back then. The following information comes from the 2006 revised edition of his book. In the early 1980’s, Norman E. Rosenthal and others at the National Institute of Mental Health (NIMH) began to investigate the possibility that depression could have a seasonal pattern. After encountering a few patients with seasonal depression, they wondered how many more there might be. They asked some local depression specialists, who said they hadn’t seen any cases. Deciding that it must be rare, they were surprised to get thousands of responses to an article about it. Their first study ended in 1982. Eventually, one of the psychiatrists, who claimed he didn’t know of anyone with seasonal affective disorder, called to say he realized he had it. In 1987 the American Psychiatric Association added SAD to their diagnostic manual. It is now known that SAD affects “up to 9% of U.S. adults in the northern part of the country[ii].” Only about 1.5% of the population are affected in southern states. SAD symptoms can begin anytime from September to Christmas time each year. Then those affected can come out of their winter cycle as early as mid-March, or later in the spring. 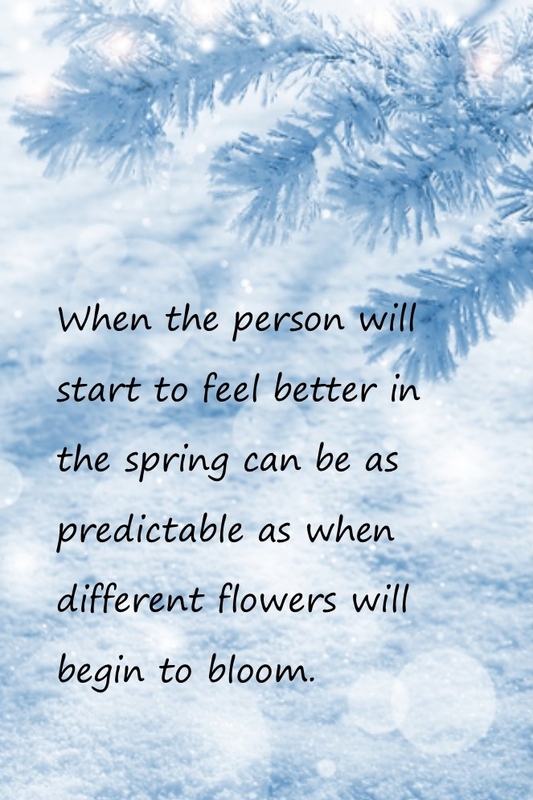 When the person will start to feel better in the spring can be as predictable as “when different flowers will begin to bloom[iii].” The farther north a person lives, the sooner the cycle starts in the fall, and the later it lasts in the spring. The worst three months tend to be December, January, and February. SAD makes the person quite tired. With the feelings of fatigue described as, “leaden and heavy[iv].” Those with SAD often claim that it takes all their willpower just to get up in the morning and to do their daily tasks. They tend to crave more carbohydrates in the winter months. Relationships suffer, because it takes so much energy to even carry on a conversation. Keeping up in a social situation can be overwhelming. The person might end up withdrawing instead. Sufferers feel tired all the time. They can’t keep up with what’s going on around them. “It’s very difficult, if not impossible, for them to summon up the information and knowledge needed for their work—or even casual conversations[vi].” It feels like information comes at them too fast to keep up with it, with minor tasks becoming overwhelming. Concentration decreases, and it’s more difficult to think through the logical steps needed to finish the work. On the other hand, in the summer the same tasks can go swiftly and easily. “Many people with SAD feel as though they have suffered from the flu all winter long. [viii]” They may crave light in the winter months. They might turn on all the lights in the house, or else take their winter vacations in southern climates. [i] Norman E. Rosenthal. Winter Blues: Everything You Need to Know to Beat Seasonal Affective Disorder. Revised edition. The Guilford Press, New York, 2006.
https://cet.org/ – Center for Environmental Therapeutics. About sleep phase problems, light therapy, etc. http://www.sada.org.uk/index_2.php – The Seasonal Affective Disorder Association in the United Kingdom. Information about treatments, symptoms, etc. http://www.lighttherapyproducts.com/ light therapy products for SAD, skin, pain and stress relief, etc.